Lockers made out of metal are typically less expensive than those made from plastic. However, many organizations often find that the purchase of several units to be something of a strain on their budget. There are many ways to save money on metal lockers that appear obvious once pointed out, but that may be easily overlooked during procurement selection. Keeping these options in mind is one way to trim the costs to fit within budget without having to sacrifice the number of physical units needed for the facility’s users. 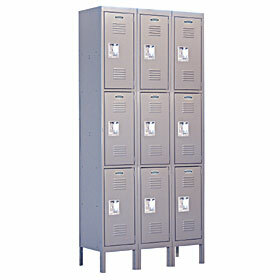 One way for organizations to save money on metal lockers is to order them with a few inches less height. 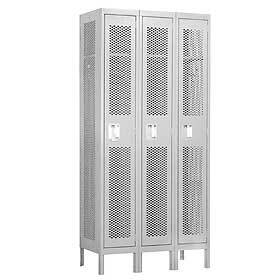 Standard size for locker height is 72 inches, but this number can be reduced to 60 inches. This is more than enough storage space for personal items and smaller articles of clothing. In some applications, work uniforms can also be folded and placed in a space this size. Organizations can also reduce the cost of lockers by investing in a louvered door rather than a vented door. Louvers are actually a form of venting that look like linear slits in the locker door. There are many applications where louvers provide all the necessary airflow for locker contents. Examples include retail lockers, lockers inside break rooms, and basic storage lockers in closets. Venting is recommended for storage of any volatile substances or extremely wet clothing. Any organization will also save money onmetal lockers by ordering them in one of the basic in-house color schemes. Custom coloring costs considerably more and is really only necessary in the higher-end facilities that typically have a budget to pay for cosmetic accents to interior design. Most industrial, commercial, and retail applications typically require only a basic blue, tan, or gray colored locker to serve the needs of their users. Lockers are typically shipped preassembled for the convenience of the installer, but they can be ordered unassembled to save on the factory cost of preassembly. We recommend this option to any organization that is buying only 2-5 locker units. Anything more than 10 units should be ordered already assembled because the time involved in putting together a large locker bay does not make the savings cost effective. However, for small break rooms and garages, less than 10 lockers added to existing storage areas can be assembled in a few hours at a considerable savings. Facilities who want to save money on metal lockers can also order them as freestanding units to be placed along the wall. The cost of recessed installation, or even semi-recessed installation, is obviously higher for new constructions and even more costly for renovations. Lockers can be stabilized at the base to simply line up along a wall at a significantly lower cost than other configuration options. As obvious as it may seem, the simple act of using manual locks can also save a great deal on locker costs. Combination locks or padlocks purchased separately can provide just as much security for users as built-in locks installed by the manufacturers. When ordering a large number of units, especially we always as clients to consider this option because it does help save money on metal locker bulk costs.